Did you know that more than 95% of described animal’s species are invertebrates? We’re talking about 95% of the world’s animals not having a backbone! Owing to their huge numbers, invertebrates are a vital part of both aquatic and terrestrial ecosystems. They are important links in the food chain, passing nutrients from plants and algae to larger organisms such as fish, frogs, salamanders, reptiles, birds and mammals. They also tell us about the quality of the environment due to their sensitivity to factors such as sediment load, pollutants, pH and more. In order to know what invertebrates are telling us, we need to be able to accurately identify them. One way to identify specimens is by using morphological features. 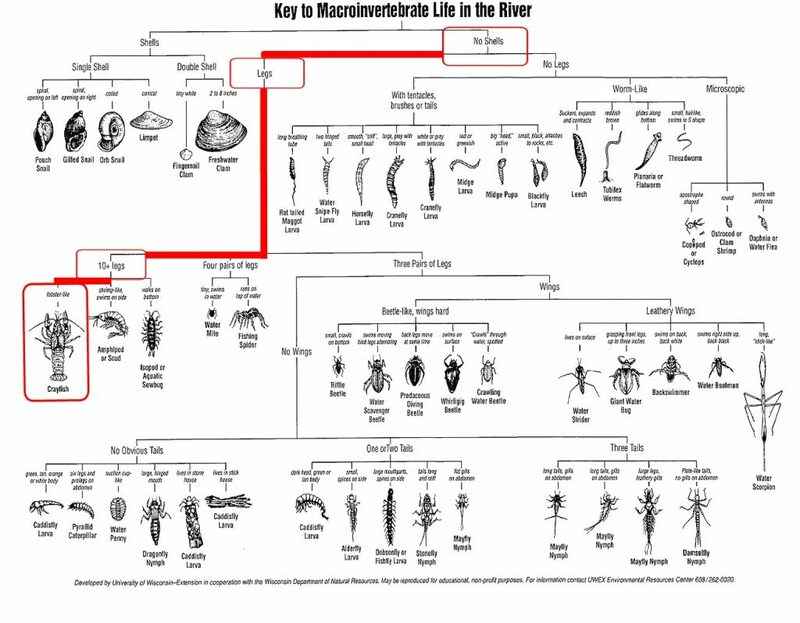 This summer I will be using morphology in order to sort and identify aquatic invertebrates that were collected during last year’s BIObus trip. As I’ve learnt over the last several weeks, this is no easy task because aquatic invertebrates are extremely diverse. Aquatic invertebrates may live beneath the water, or they may live on the surface or on the plants surrounding it. Some breathe water, others breathe air. They may be able to walk, swim, float, skate, fly or glide on their bellies—or they might not move at all. On top of that, a large number of insects lead double lives. Dragonflies, mayflies, stoneflies, caddisflies, dobsonflies and more are aquatic as juveniles. Then, when they undergo their final molt, they leave the water and become winged adults that fly in the air. 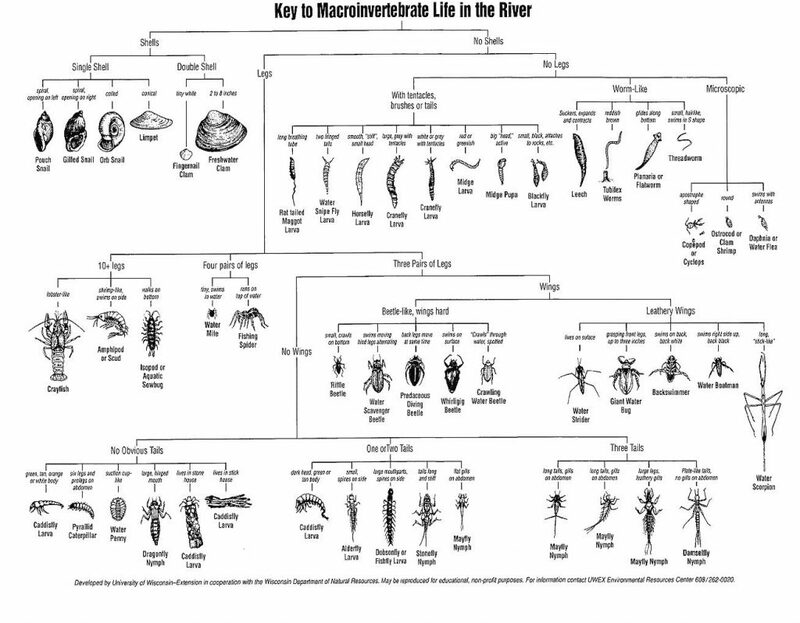 Other aquatic invertebrates remain aquatic their whole lives. Water boatmen, predaceous diving beetles, whirligig beetles, water striders, fishing spiders and others spend all their days hunting in and around water. Essentially, the point I’m trying to get at is that there are a lot of animals that need to be identified, and it would take an expert to have them all memorized. Since I’m not an expert, I rely on an identification key. There are several different types of identification keys, but the one I’ve been using is similar to this one. 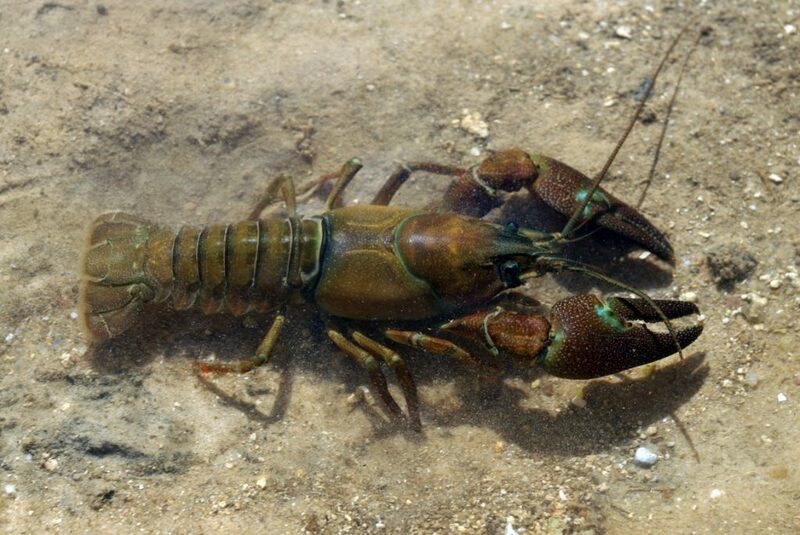 Crayfish can be found at many of the sampling locations we will be visiting this summer. I would say that it has no shell, it has legs, it has 10+ legs, and it is lobster-like which leads us to the identification of crayfish. We use keys similar to this one at BIO in order identify specimens accurately and quickly. This skill is called taxonomic identification, and we use it in combination with DNA barcoding. Many people believe that in order to identify a specimen, one must choose between taxonomy and DNA barcoding. However, both techniques are used for two different purposes and are integrated for optimum efficiency. Taxonomy gives names to species, define their limits and the diagnostic characters to recognize them. DNA barcoding use genetic data to assign a name given by taxonomy to an unidentified organism. The two approaches used together will help us continue to identify species and expand our knowledge. I hope everyone is enjoying their Spring! I sure have been. Everything here in BIO Collections is going well. There has been some standardized sampling done at the rare Charitable Research Reserve in Cambridge (see Shannon’s, Josh’s, or Danielle’s blogs for more details!). Everyone is also getting geared up for the Don River Watershed Bioblitz this weekend. As for me currently, I just finished processing the standardized samples from Pacific Rim National Park and now I am starting the processing on Gulf Island National Park! Both are located in British Columbia. One day as I was looking through my microscope I realized…I had no clue what these parks even looked like! Out of curiosity (and a bit of embarrassment) I did some research and I have decided I am going to share it with you! Both parks are located at the southern portion of Vancouver Island. Pacific Rim is on the west side and Gulf Islands on the east side. They are roughly 180 km away from each other. While their close proximity might suggest that their climates are similar, both parks are quite unique from one another! 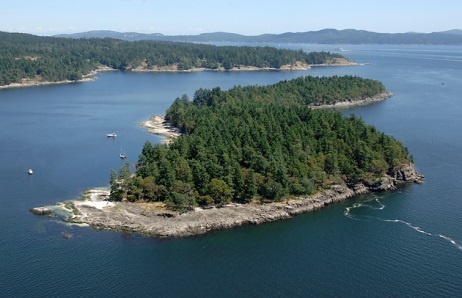 Gulf Islands National Park Reserve includes 16 different somewhat smaller islands. It also includes some islets and reef areas collectively making a total of 33 square kilometers of protected land. The islands locations give rise to Canada’s only area with a Mediterranean-type climate. The summers are usually warm and dry and the winters are mild and wet, not usually dropping below zero degrees Celsius. This microclimate allows for some interesting diversity among the organisms that live there! Pacific Rim National Park Reserve is known for its rugged coastline and its extremely lush temperate rainforests. The areas along the coast have a Maritime-like climate, contrasting the areas inland which tend to have a humid rainforest climate. It is comprised of three areas, Long Beach, West Coast Trail, and the Broken Group Islands. In the fall and winter the areas gets exposed to continuous moist air masses from the Pacific Ocean. These air masses are forced to rise because of the surrounding mountain ranges, which ultimately leads to a large amount of precipitation. 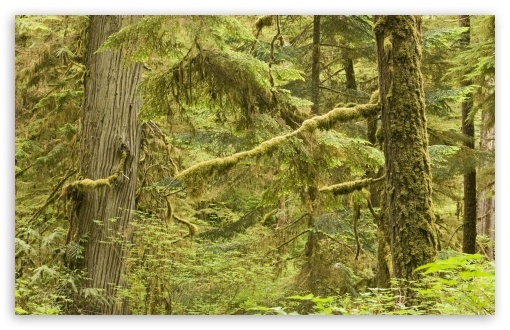 Pacific Rim National Park is only one of a few rainforest areas in Canada! That is pretty much it for this week folks, but since this blog entry is a little less buggy (pun not intended) I will leave you with a joke. What is a caterpillar scared of?…….a dogerpillar!!! Stay tuned for info on my next trip to Rare, Bioblitz stories, and maybe even another lame joke or two!